If you are planning a trip to the north coast of California, Oregon, Washington or British Columbia in Canada, you may be overlooking a destination that has been hidden for years. 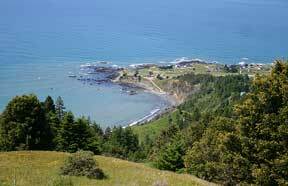 Here at Shelter Cove, CA on the Lost Coast is a small fishing community designed for a vacation get-away or a retirement home. Some may want a walk on the beach or a afternoon of tidepooling, others may want just to land at the airstrip and golf for the day. Hiking, camping and backpacking are popular with visitors. Maybe a romantic B&B with a fabulous view of the migrating whales to watch from a deck is your desire. Yet others fly-in to enjoy charter boat fishing and believe me the fish are worth the trip. No matter if one is investing in retirement real-estate or just lodging over at a motel or inn, one can not help but enjoy the fabulous 360 degree panorama of tidy homes, fir trees, deer, mountains, beaches and surf. Not to mention the Pacific Ocean. The area is an eco-tourists dream. Also enjoy the Avenue of the Giant Redwood trees, Sinkyone Wilderness State Park, every turn in the road is a wonderful place to visit. Arrive in your airplane, RV, car or bicycle all are welcome. Backpackers sometime arrive by foot. 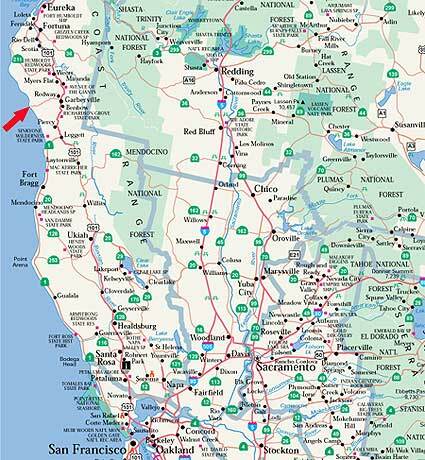 By traveling north to Humboldt County through Mendocino County you will come to Garberville which is the turn to the ocean and Shelter Cove.